What’s That on Your Chin, Ocean? My brofur, Ocean, is prone to chin acne. He has had it off and on most of his life, although his outbreaks have been very mild for the past couple of years. Maybe that’s because it is common in kitties 2-4 years old due to hormones and he is six now. When mom first discovered it several years ago when he was a youngster, she thought he just had a dirty chin and tried to scrub it clean. Well, that wasn’t the best thing to do. When some of the spots came off, they started to bleed. She was volunteering with the rescue at that time and learned that he most likely had feline chin acne. There are other conditions that can look similar to chin acne, like skin mites, ringworm and yeast infection, so a trip to the V-E-T might be in order to check it out. Both cats and dogs get chin acne, but they are not quite the same thing. The description of feline chin acne sounds pretty scientific to me but your humans will probably make sense of it. Sebaceous glands in the chin are connected to hair follicles. When the glands produce an excessive amount of oil, the follicles get clogged with black sebaceous material. Blackheads form which can become swollen, irritated and infected. Some say eating out of colored plastic dishes is a cause of chin acne, but at least one veterinarian says that is unlikely. How is chin acne treated? In very mild cases, warm compresses can help unclog the follicles. Just don’t scrub like mom did! Left untreated, chin acne can become itchy, infected and very uncomfortable. In severe cases, the blackheads can form abscesses which can break open and form crusts. A bacterial infection can make things worse and require treatment with antibiotics. Some cats can benefit from a fatty acid supplement, especially Omega 3 fatty acids. You can get a fresh source of Omega 3s from sardines, herring and anchovies. 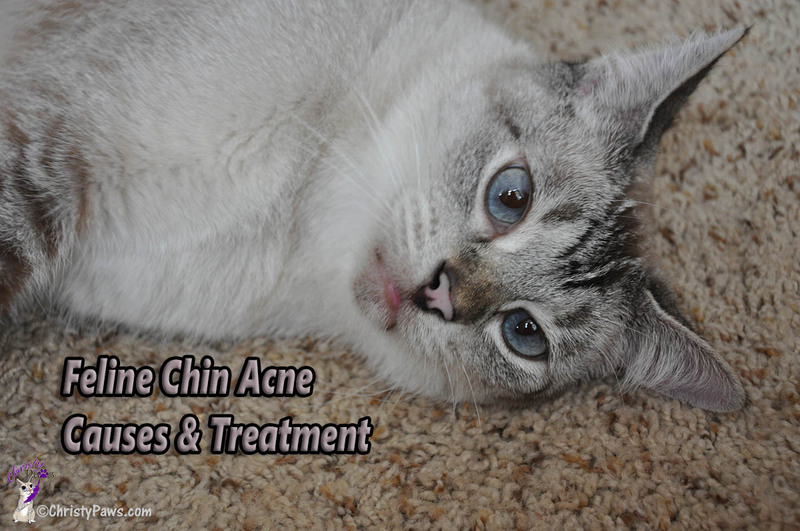 Feline chin acne is a chronic condition which can be controlled but there is no cure for it. Kitties who are prone to this condition should have their chin cleaned regularly. Mom cleans Ocean’s chin with medicated wipes containing chlorhexidine. Mom used to feed us from stainless steel bowls but always thought they were too big for the amount of food we get. Then she found these white, restaurant grade plastic bowls which she loves because they are the perfect size for the couple of ounces of raw food we get twice a day. She didn’t see that it made any difference for Ocean but, between feline chin acne and whisker fatigue, she decided to look for something new. We now use small, glass dishes like the ones above. In the meantime, keep your chin clean! dvm360: Just Ask the Expert: How do you manage canine chin acne? Tagged cat, chin acne, Ocean. Bookmark the permalink. 16 Responses to What’s That on Your Chin, Ocean? One of the kitties at the shelter our mom volunteers with has chin acne and gets her chin cleaned regularly, too. Thank you for sharing this information with us. Mom says she didn’t know much about chin acne before she read this. Lexy gets acne on her chin. Mommy doesn’t have to do anything for it, because it comes and goes. We’ve heard eating out of plastic dishes can cause chin acne. So we kinda dispute what that one vet says. Not that there aren’t other causes. Thanks for sharing this important info! Sampson gets chin acne sometimes, though it’s not really bad. I used to think it was dirt too! Wow mee not know wee katss can get acne!!! Fank you fur sharin about thiss…ladyMum usess onlee Corelle bowlss fur mee water an kibble an wet food. Shee washes dishes efurry day…. I’m glad your human learned some things to deal with Ocean’s chin acne – and that she passed it along! Two of my kitties have had chin acne as they’ve gotten into their senior years. Raven has periodic episodes of chin acne, but it hasn’t required medication yet. I think just like with allergies, some cats are more predisposed to having chin acne than others. My Angel Bobo had it (mostly before I knew about plastic bowls which many vets DO believe is a cause). Cody never had chin acne but has seasonal allergies, go figure. I really think it is plastic dishes. My Lucy used to get that when I used plastic dishes and would get it when she licked butter off my plastic toast plate.